Last week was all about the inspiration for my master bathroom’s new look. This week it’s all about translating inspiration to reality. When it comes to the master suite, the bedroom leans modern and masculine with a dark blue, black, white and silver color palette. So when it came to the master bathroom, I wanted to add some feminine touches without going overboard, of course. The overall design style I’m going for is classic modern luxury. The neutral color palette – espresso cabinetry and white, gray, and silver finishes – is classic. The straight, clean lines and minimalist finishes keep it modern. I’ll use materials like marble, patterned wallpaper, and the decor to add a bit of luxury and a feminine touch. As I mentioned in last week’s post I’m by no means off to a bad start. My house is only a year old so my bathroom has a spacious layout with a big window that brings in natural light, a drop-in tub, two vanities, a separate shower and water closet. But the builder grade bathroom badly needed some upgrading, style, and personality. The espresso cabinet color and polar white slab counters came standard which was a good start. The walls were painted Sherwin Williams Antique White…fine. The floors were 12”x12” ceramic tiles that were fine but pretty standard and wasn’t a style I loved. Pretty blah. Here are some photos. I realize the photos aren’t very good. Vanities and shower in the corner. I don’t have very good before photos! Construction is still in progress. The drop-in tub and niches. Before moving in we already put in some upgrades that got us to where we are today. Through the builder, we upgraded the cabinets to a simpler, modern shaker style door as you can see in the previous photos. On our own, we had the floor tiles replaced. To make it more modern and take it up a notch we chose large format, rectangular tiles by Porcelanosa. The tiles are 17”x26”. We went with Ferroker Niquel, which is a light gray with a bit of abstract pattern. Already the new floor tiles added a modern touch and we really loved the way they transformed the room. The new tiles going in. It’s not a great photo because install and clean up is still in process but it was a transformation from the before. I also had to a have a bright bathroom with lots of light. The builder only put in can lights as standard so I upgraded and added vanity lights. Vanity lights won’t cast the weird shadows on your face because they are in front of you as opposed to above your head when you’re looking in the mirror. Pendants or wall sconces are also good alternatives. You have to get all these hard wired by an electrician so it’s key to design it into your plan early on. I was looking for vanity light fixtures that were on the wider side since the counters are so long, but also within a budget since I had to get two. I went with the Driscoll 3 Light Vanity by Sea Gull Lighting* in chrome. It is 24.5” wide, has a nice streamlined profile for being so large, and the finishes are clean and simple. It can be hung up or down, which I hung them downwards. I kept to chrome finishes in my bathroom, but the Satin Bronze* version looks like it would be a really nice matte gold. I’m using LED light bulbs with them and it makes a huge difference in the brightness and whiteness of the room. Since I purchased and installed these almost a year ago I wasn’t thinking ahead to how a future design of the bathroom might look. If I were to choose light fixtures today I might go with something different. However, they are new and I still like them so I’m sticking with them. Here they are in my bathroom. It seems like I’ve already done quite a bit to the bathroom, but it still doesn’t feel quite finished. To add more personality and style, for the One Room Challenge, here are the design ideas and projects I want to complete. It’s amounted to quite a list! Scroll down for my design board. Wallpaper – I loved the look of a marble tile backsplash up to the ceiling in a classic two-toned pattern such as those in my inspiration, but I know it will be very expensive and labor intensive. So, alternatively, I want to put in wallpaper on the two walls where the sinks and vanities are to create an accent wall and focal point in the bathroom. 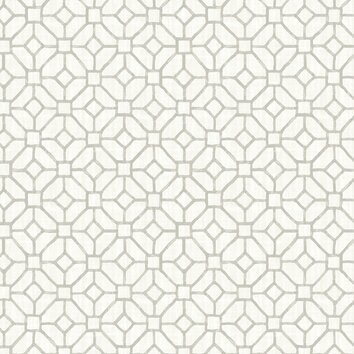 I looked for a wallpaper pattern that will give me a similar look as white and gray tile and this is it*! I’m so excited about this wallpaper! It’s by Brewster. New paint color – The Antique White on the walls isn’t doing it for me. In this room with the bright white tub, sinks, and counters the paint color is definitely coming off too yellow and dragging the room down. After choosing the wallpaper, I’ve decided to go with a more complementary white like Benjamin Moore Chantilly Lace which is a whiter white and does not have many undertones. Marble tile – Marble, especially the white with gray veins variety, is such a timeless and luxurious material to me. I’m not using it on my vanity walls but I want to use it somewhere! The perfect place for it is on the two niches on either side of the drop-in bathtub. The niches are pretty large, approximately 2.5’ x 5’ so it’ll be a standout accent. I decided to go with a 2” hexagon tile in Carrara White*. I debated the 1” hexagon tile* but decided the size of the niches were too large and all the grout lines would look too busy for me. I think the marble tiles will add that bit of luxury I’m looking for as well as add some interest, texture, and pattern to the bathtub area which is void of any personality at the moment. Check out the marble tile samples against the wallpaper on my IG. Love! Side note: DO get samples of all your finishes if possible because they often look different in person than online. I’m glad I got the 2″ tile samples because it caused me to change my mind about the 1″ tile. Even if you have to pay for the samples it’s worth it to avoid an expensive mistake. Glass shelves – Since the bathtub niches are so large they really feel strange and unfinished when left completely empty. So after the marble tile goes up, I’m going to install 2 glass shelves in each niche. This will create the perfect place for storing bath essentials like towels and bath products as well as a beautiful way to add personalized decor in the bathroom like photos and frames. I’m planning to get these custom made so they’ll fit the niche perfectly. New light fixture – To finish off the bathtub area I would really love to change out the recessed light above the tub and put in a pendant light fixture. There are SO many beautiful options I had a hard time narrowing it down. Do I want to go modern or traditional? Pendant or chandelier? To keep to the classic style with a modern twist I decided on a pendant in the latest lantern styles. Like this* or this*. Now to pick just one! BUT I already know that the covered recessed light is there by code so I don’t know yet if a pendant light will be possible. We’ll find out once we get in there so keeping fingers crossed! New hardware – The wall hardware like the towel bars and rings that the builder put in are just fine from a quality standpoint but I’m not too keen on the style. So I’m putting in all new hardware. I really only need to replace the two towel rings, the toilet paper holder, and add two clothes hooks so I think it’s worth getting something I really like. I’m between these two options: Asbury Collection by Restoration Hardware or Pearson by Pottery Barn. More on these in a future post. Accessories – Finally, I’m going to actually get accessories and decor for the bathroom! This was something I always thought about but never really committed to so I only had the odd vase, tray, or votive but it wasn’t really pulled together. I’m thinking lots of silver finishes and maybe some marble. I also don’t want the bathroom to feel too cold and stark with an all white and gray color palette so I’m going to bring in some of those watery blues to give it a spa feel with sea inspiration from living by the San Francisco Bay. What do you think? Anything you would do differently? Comment below! I’ll also be sharing updates on my Instagram! Update! Read about the project’s progress: Week 1 – Inspiration | Week 3 – Paint Color | Week 4 – Wallpaper | Week 5 – Marble Tile | Week 6 – The Reveal For even more inspiration check out all the projects by talented bloggers of all design styles at One Room Challenge Week 2 and Thoughts of Home on Thursday. *Starred are affiliate links. Thank you for your support. Hi Rosanna! I really love your design plan, especially the wallpaper! That marble in the niches will be beautiful. Excited to follow along. It’s so fun connecting through the ORC! Your design plan is stunning, and I can’t wait to see what you do next! This is going to be such a great bath! I love all the elements you’re bring in and I love the forethought you had of making changes even while you were building! Wouldn’t it be great if builder grade wasn’t so basic?!? I can’t wait to see what kind of progress you make this week! Thanks Tricia! Now the doing begins! Hi Kristin! Thanks so much for your comment! Bathrooms are always tough but I figure since it isn’t a complete gut renovation I can handle it right? Good luck with yours too! Rosanna I adore the direction that your room is headed towards! You did SO much better than I did in my room this week. Hi Laura, thanks so much for your message! I’ve only done the fun and easy stuff so far which is put together the design! The actual doing will be the hard part =) Thanks so much for the invite to share! I would love to!